(ri-flek -ter) Short for reflecting telescope. A device installed in luminaires used to direct light from a source via specular or diffuse reflection. a telescope equipped with a mirror objective. Reflectors are used principally for photographing the sky and for photoelectric and spectral studies; they are sometimes used for visual observations. In a single-mirror reflector, the objective is a single, usually parabolic, mirror, and the image is produced at the mirror’s prime focus (Figure 1, a). In reflectors with a mirror diameter greater than 2.5 m, an observer’s cage is sometimes mounted at the prime focus. In small and medium-size reflectors, light is reflected by an additional plane mirror to the side of the tube (the Newtonian system, Figure 1, b) for convenience of observation. A two-mirror reflector uses two mirrors—a primary and a secondary—with curved figures and an arbitrary number of plane mirrors that direct the light to a point convenient for observation. The secondary mirror may be placed in front of the prime focus of the primary mirror or behind the prime focus. Each of these arrangements can reduce the convergence of a beam of light, thus increasing the focal length and image scale in comparison with the focal length and image scale at the prime focus, or it can increase beam convergence, thus reducing the focal length and image scale. In classical two-mirror reflectors, the primary mirror is a paraboloid and the secondary mirror has the form of some quadric surface of revolution. In a Cassegrain reflector with a secondary mirror that reduces the beam convergence and is positioned in front of the prime focus (Figure 1, c), the secondary mirror is a convex hyperboloid; in a Gregorian reflector with a secondary mirror that increases beam convergence and is located behind the prime focus (Figure 1, d), the secondary mirror is a concave ellipsoid; and in the afocal Mersenne reflector system (Figure 1, e), the secondary mirror is a paraboloid. In all classical reflectors, spherical aberration is completely corrected, but appreciable coma restricts the field of view. This coma is equal to that of an equivalent single parabolic mirror. The length of the comatic spot is equal to 3/16 A2wf; here, f is the focal length, A is the aperture ratio (A = D/f, where D is the mirror diameter), and w is the angular distance of the star from the optical axis of the reflector (in radians). Astigmatism can be corrected only in systems where the secondary mirror increases beam convergence and is positioned in front of the prime focus; such systems are inconvenient in operation. Nonaberrational reflector systems are possible; the Schwarzschild and Ritchey-Chrétien systems use a primary mirror with a hyperboloid figure, and the primary mirror in Maksutov systems has the figure of an ellipsoid, sphere, or oblate spheroid (seeMAKSUTOV TELESCOPE and MENISCUS SYSTEMS). Spherical aberration and coma are corrected in all nonaberrational reflector systems. Ritchey-Chrétien systems with secondary mirrors that reduce beam convergence and are positioned in front of the prime focus have become most widely used by virtue of their design features. In the Cassegrain and Ritchey-Chrétien designs, light travels to the focus through a central perforation in the primary mirror. Corrector lenses (correctors) are often used in reflectors to correct residual aberrations. The correctors make it possible to increase significantly the useful field of view. Strictly speaking, use of a corrector lens places a reflector in the class of catadioptric telescopes, but in view of the relatively small size of the corrector and the possibility of operating the reflector without it, this change of terminology has not been adopted. 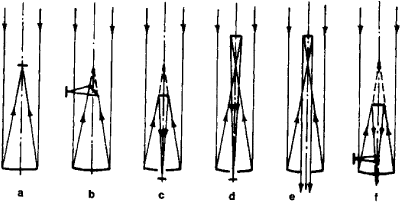 In order to provide convenience of observation, plane mirrors direct light to the side of the telescope tube (the Nasmyth reflector system, Figure 1, f) or through the tubular declination axis and polar axis to a stationary laboratory (coudé system). The laboratory provides permanent housing for large spectrographs and other precision instruments that cannot be suspended on moving parts of the telescope because of their great weight or size. Large modern reflectors can be converted from one optical design to another by changing the secondary and plane mirrors. The reflector has a number of advantages over the refractor, including the complete absence of chromatic aberration and significantly smaller residual aberrations. This makes it possible to use systems with an aperture ratio reaching 1:3.3. The requirements for precision in a reflector’s mirror surfaces are much greater than those for lens surfaces in a refractor. In large reflectors, special mirror support systems that prevent deformation of the mirrors due to their own weight must be used, and steps must be taken to prevent temperature deformations of the mirrors. For this reason, reflector mirrors are made of materials with a low coefficient of linear expansion, such as Pyrex, fused quartz, or devitrified glass. The cast blank undergoes annealing for several months in order to remove internal stresses, after which it is roughly finished to the necessary dimensions with diamond cutters, cutting tools, and corundum and polished with emery until the required curvature is obtained. Polishing with micropowders brings the necessary surface figure to an accuracy of fractions of a micrometer. In the process of polishing, the mirror surface is constantly monitored using Maksutov or Ronchi shadow tests or by means of an unequal-arm laser interferometer. Here, autocollimation testing is used to monitor parabolic mirrors, and compensation systems with additional optical elements that compensate for aberrations of the mirror under study (Maksutov, Offner, and other compensators) are used for secondary mirrors. Star testing is done using a Hartmann screen. The reflecting surfaces of the mirrors are formed by a thin film of metal (usually aluminum) applied by evaporation in vacuum chambers (seeMIRROR). Reflectors may be mounted on a fork mounting, an English mounting, or, less often, a German mounting. In the early 1970’s, the largest operating reflector had a primary mirror 5 m in diameter (Palomar Observatory, USA; constructed 1943). In the USSR, the largest operating reflectors are a reflector with a 6-m mirror, constructed for the Special Astrophysical Observatory of the Academy of Sciences of the USSR in the Northern Caucasus; and two reflectors with 2.6-m mirrors at the Crimean Astrophysical Observatory of the Academy of Sciences of the USSR, and at the Biurakan Astrophysical Observatory of the Academy of Sciences of the Armenian SSR. This first reflector has two basic interchangeable optical designs—a prime focus and a Nasmyth focus. In contrast to other large reflectors, it is mounted on an altazimuth mounting. The construction of large reflectors with diameters of 4 to 6 m entails major difficulties; at the same time, the solution of a number of astronomical problems requires larger instruments. Current development work is being conducted on systems with composite mosaic mirrors whose individual elements must be adjusted by tracking servosystems and on units containing several parallel telescopes that focus the image at one point. Maksutov, D. D. Astronomicheskaia optika. Moscow-Leningrad, 1946. Maksutov, D. D. Izgotovlenie i issledovanie astronomicheskoi optiki. Leningrad-Moscow, 1948. A single rod, system of rods, metal screen, or metal sheet used behind an antenna to increase its directivity. A metal sheet or screen used as a mirror to change the direction of a microwave radio beam. A layer or horizon that reflects seismic waves. A layer of water, graphite, beryllium, or other scattering material placed around the core of a nuclear reactor to reduce the loss of neutrons. Also known as tamper. 1. A device that redirects light or sound by reflection. 2. The device on a luminaire which controls the distribution of light from the lamp by reflection.